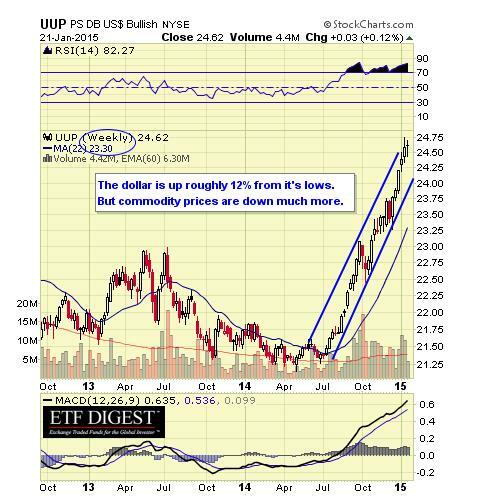 When the U.S. dollar is strong, commodity prices drop since they’re priced in dollars. But recent commodity price declines are excessive. The dollar DXY, +0.17% as measured by the PowerShares DB US Dollar Index Bullish Fund UUP, +0.12% has surged, but not nearly as much as commodity prices have fallen. These commodity drops indicate a serious decline in demand, which in turn has translated to weak global GDP growth. This decline is already evident, as recessions are visible in many developed markets (Europe) and also emerging markets. 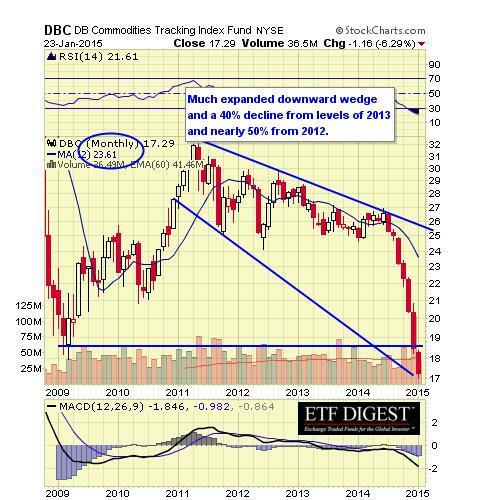 Below is a weekly chart of UUP and a monthly chart of the most widely traded commodity-linked ETF, PowerShares DB Commodity Index Tracking Fund DBC, +2.41% . 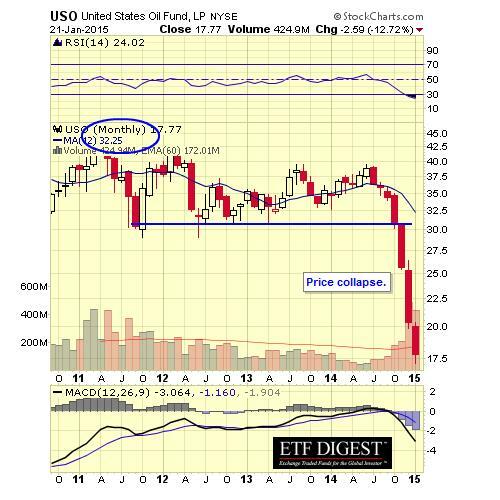 Normally under such conditions, recession and deflation are in the cards. The only thing protecting markets from a severe recession has been central bank money printing. But as the charts show it’s done nothing to raise commodity prices or inflation, which central banks argue is the primary purpose of QE policies. The ECB now has taken the QE baton from the Fed with the stated goal of increasing inflation. 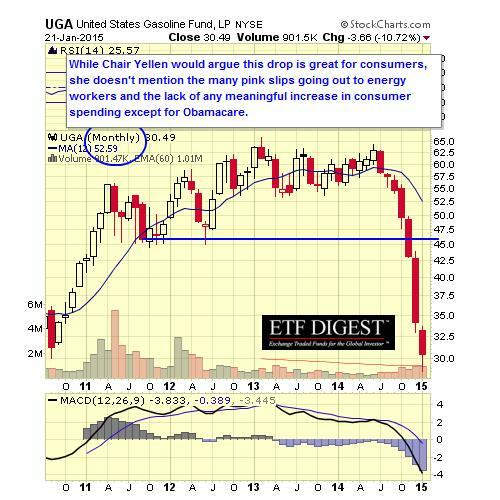 It won’t work to defeat deflation but may lift stocks prices for a time. 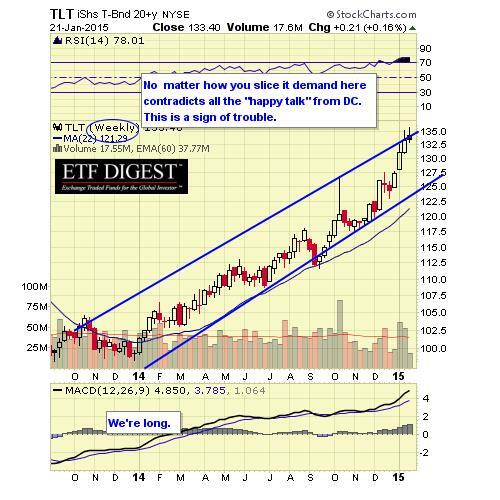 Below is a chart for iShares 20+ Year Treasury Bond ETF TLT, +1.77% , a long-term Treasury ETF. Seeing yields at these low levels for a debt instrument with this much duration should communicate fears of deflation or recession to investors. Perhaps this is just a new era where central banks are now in full control. But let’s face it, prices for oil and other energy markets are down nearly 60% more or less from routine highs in the summer of 2013. The Saudis may be responsible for the deliberate waterfall decline in crude oil prices to defeat North American production, but collapse in demand reflecting global GDP weakness can’t be discounted. 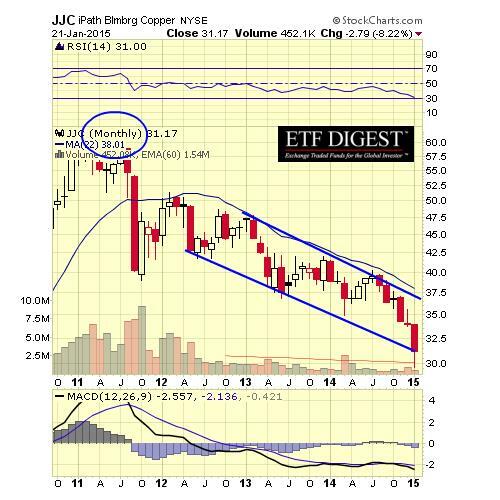 Copper prices are another area of concern regarding economic growth. For many years the commodity has been referred to as Dr. Copper, since many believe it has a PhD in economic forecasting. Now it’s declined 40% over the past two years. 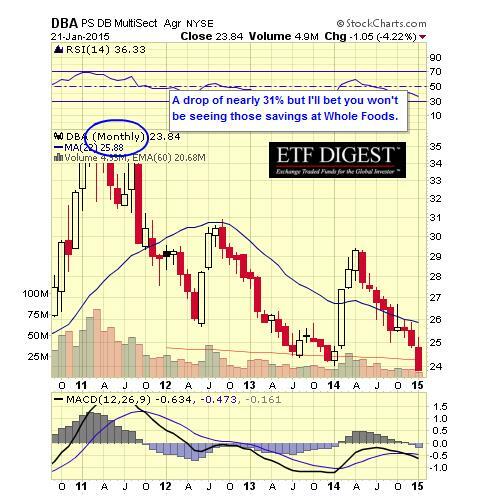 The primary agriculture ETF, PowerShares DB Agriculture Fund DBA, -0.26% displays a variety of products showing deflationary tendencies and has declined 30%. 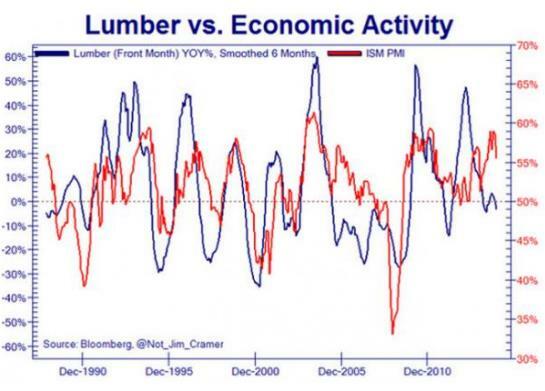 An analysis of lumber prices compared with the ISM (Institute for Supply Management) displayed below shows how prices are closely tied to manufacturing data.